My main concern has been the nursery, because practically it just needs to get done. I have been “working” on this nursery ever since Isaac died. It was part of my need to complete some part of my former pregnancy. I got distracted along the way and slowly it became the isle of unfinished projects. this was the nursery about a month after we buried isaac. Being pregnant with a cerclage and receiving shots of hormones that make me extra fatigued and nauseous have limited my ability to actually spend a lot of time in this room. Thankfully, my little sister offered to come down once a month on weekends to help me tackle my endless nesting list. It helps that my sister works on the design team at her local Ikea, so we took a trip to my Ikea store and she helped me pick out a few items that would aid in organization and displaying items around the room. Keith and I spent the previous weekend organizing the dresser, cleaning out the closet, and building the storage bench (here). My task this week has been to figure out where everything else will go. My second biggest problem area has been how to fill the wall space. I didn’t want a ton of stuff on every wall so I was going to have to be extremely intentional with what went into that room. I also wasn't trying to give this room a "baby" feel. If I was going to be spending everyday in here, this needed to feel like a retreat (I already want to be in this room over my bedroom). Here are some things I did to keep the process manageable. 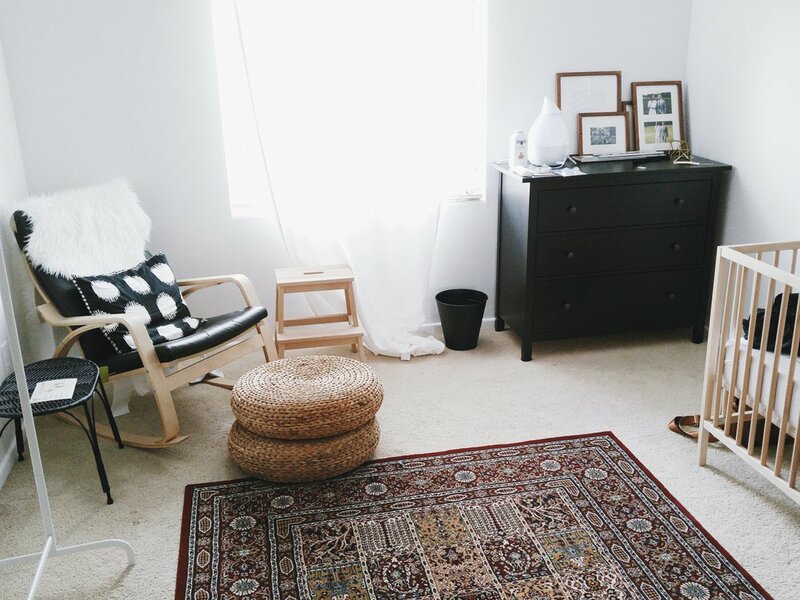 the furniture layout i finally settled on after adding the bench to the nursery. First, I knew I wanted the main colors to be neutral (blacks, whites, beiges, and browns). I know minimalism has a tendency to be creeping on these colors lately, but I felt it anchored me and the room. And it can really give you the ability to bring natural materials into the space. All of my main furniture--crib, seating, dresser--revolved around these colors. Shortly after Isaac’s birth, I was sweetly gifted with the major items from family and people in our past and present communities. All of it happened to be Ikea so I thought, why not stick with it. I snagged a deep wine colored rug from there (seriously I could fall asleep on that rug) and slowly began to develop a theme for the room. Boho Africana (or Wakanda Forever now that I have seen Black Panther). Next, Ashante and I began categorizing all the objects in the room by color. It was easy to see what our dominant color palette was. Greens, Yellows, Blues, Oranges, and the neutrals. This included pillows, books, small decor items, frames, artwork, linens, toys. Everything that was going to be on a wall, shelf, or displayed on a piece of furniture. With everything grouped by color, I could also see the variety of textures I was working with, what I had too much of or too little of. Seriously, doing this helped my pregnancy brain so much. Lastly, my sister sketched out different layouts for each wall of the stuff I knew I wanted up. Once I decided on something, she began drilling everything into place. Window shades went up (still trying to find the perfect curtains for the main window), shelves mounted and art framed. I don’t want to dive into my decor on this post since its not quite done yet, but I am already really pleased with how far the room has come over just two days. still have another side of the room to work on, so Keep a lookout for my progress! what are your best tips for decorating a nursery?